Ever since the prestigious film to star NTR and Ram Charan was announced as the next project of director Rajamouli, who’s fresh from the success of his internationally acclaimed epic venture Baahubali, there have been several expectations and of course the wait has been quite anticipatory. The big day is finally here. The crazy combination of the scions of the Konidela and Nandamuri families – NTR and Charan – is being looked forward to by fans of both the families. On November 11, the film was launched in quite a grand fashion amidst the presence of several industry biggies. Mega Star Chiranjeevi garu gave the ceremonial clap and VV Vinayak garu switched on the camera. Legendary Director K. Raghavendra Rao garu handed over the script and directed the first shot. 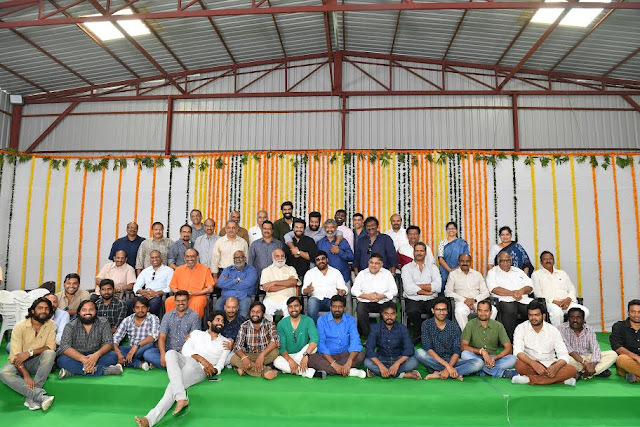 Prabhas, Rana, Kalyan Ram, Koratala Siva, Vamshi Paidipally, Boyapati Srinu, Venky Atluri, Meher Ramesh, Dil Raju, Allu Aravind, PVP, Shobu Yarlagadda, Vamshi Krishna Reddy, Vikram, Shyam Prasad Reddy, BVSN Prasad, KL Narayana, Suresh Babu, ML Kumar Chowdary, Naveen Yerneni, CV Mohan, Yalamanchili Ravi Shankar, Paruchuri Prasad, NV Prasad, Sai Korrapati and many other film dignitaries attended this event. Presented by D. Parvathy, the film is going to be produced under the DVV Entertainments banner by DVV Danayya. 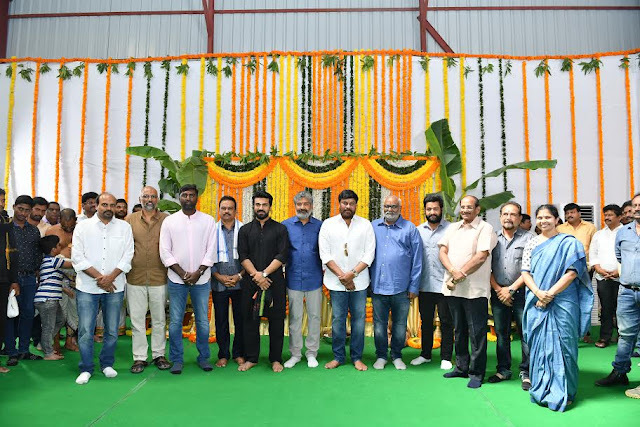 The producer has already made it clear that the film will be made with high standards that will elevate the stature of Telugu cinema even further after Baahubali. Speaking about the same, DVV Danayya said, “It is a matter of honour to be producing probably the most awaited film of Telugu cinema. This whole project is like a dream or maybe I can call it a dream come true. Working on a film in the combination of stars like NTR, Ram Charan and Rajamouli is something that is really exciting for me. There are already great expectations on the film with both the Nandamuri and Mega fans expecting something out of the ordinary, and I promise, I will make sure no stone is left unturned from my side in that regard and we will make no compromise on anything the team requires. The shooting of the film will begin from November 19. This first schedule will see NTR and Ram Charan shooting for a high octane action episode. We will soon make an announcement about the rest of the cast.